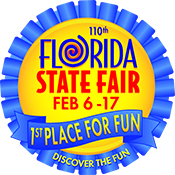 The Florida State Fair 2015 At the Florida State Fair you will find over 100 Midway rides, traditional and wonderfully wacky Fair food, live entertainment, Agricultural exhibits, Horse shows, a wide variety of competitions, shopping and more! Discover the Fun! at the Florida State Fair. Agricultural exhibits, Horse shows, a wide variety of competitions, shopping and more! Discover the Fun! at the Florida State Fair. Over 100 FREE things to see and do! Valentine's Day falls in the middle of the Florida State Fair! Valentine’s Day is coming up soon! Don’t miss wait until the last minute to get the perfect gift. Welcome to the Florida State Fair, Gates open at 10am – Let the Fun Begin! Discover the Fun with over 110 FREE Things to See and Do! The Hilton Garden Inn Tampa East/Brandon hotel is located in Highland Manor Office Park near Sabal Park. We parovide spacious guestrooms full of thoughtful amenities complimented by friendly service and a relaxed Florida style atmosphere at an affordable price. At thi sHilton Garden Inn hotel in Tampa, Florida we specialize in the kind of service you’ve learned to expect. Great American Grill serving breakfast, lunch and dinner and evening room service. Pavilion Pantry convenience mart making food available 24-hours a day. Complimentary high-speed internet in guestrooms and public spaces. Complimentary 24-hour business center with secure PrinterOn remote printing. Complimentary parking and area shuttle. 4,000 square feet of flexible meeting space to accommodate up to 180 guest with full catering services. In-room hospitality center with microwave, refrigerator, and coffemaker. Two dual-line phones with voicemail; data ports and a large work desk. Heated outdoor pool and whirpool. Come enjoy a taste of Florida hospitality and exceptional service at the Hilton Garden Inn Tampa East/Brandon hotel. Our Tampa, Florida hotel is within 3 miles of the Florida State Fairgrounds, MIDFLORIDA Credit Union Amphitheatre and the Bob Thomas Equestrian Center plus minutes from shopping, restaurants and entertainment. Be our guest at Country Inn & Suites, Tampa East. Out welcoming staff, friendly service and amenities, such as our free Hot & Healthy Breakfast Buffet, outdoor pool, fitness center, high-speed internet access, pet-friendly rooms* and fresh baked Otis Spunkmeyer cookies will make you feel perfectly at home. Our hotel provides a warm and welcoming atmosphere for both business and leisure travelers. We are conveniently located near I-75 and I-4, Florida State Fairgrounds & Amphitheatre and the Seminole Hard Rock Casino. *Limited pet friendly rooms. Please call hotel for availability. Closest and newest Marriott Hotel to the Fairgrounds!!! Less than 1 mile away!!! Fairfield Inn & Suites Tampa Fairgrounds/Casino is ideal for business or leisure travel. Our spacious rooms include 37″ LCD HDTV’s with over 80 channels, complimentary well-lit work desk and luxurious bedding. After a great night’s rest you can enjoy a vigorous workout in our well-equipped fitness center., followed by a complimentary hot Breakfast Buffet. Enjoy our seasonal outdoor pool and relax in our Hot Tub. We also have a complimentary 24-hour Business Center available for you use, as well as Guest laundrey facilities on site! No need to leave your pet at home – we now have pet-friendly rooms available. Located less than miles from the Florida State Fairgrounds. Our friendly and attentive staff awaits your arrival! Amenities: Outdoor pool and fitness facility, complimentary wireless internet access is available in public areas. Business amenities include a 24-hour business center and a meeting/conference room. The hotel offers a bar/lounge, complimentary breakfast is available. Additional amenities include gift shops/new-stands, laundry facilities, and dry cleaning/laundry services. Guest parking is complimentary. Amenities: Complimentary hot breakfast with signature cinnamon rolls and pancake machine, outdoor pool, free Wi-Fi and aerobic exercise room. All rooms come with refrigerator and microwaves, ironing board and iron, standard cable TV and complimentary transportation within a 3 mile radius. Priority Club Points available on all stays. Located less than 1 miles for the Florida State Fairgrounds. Feature an outdoor pool and a fitness center. The on site Waterworks Lounge and Restaurant serves breakfast, lunch, dinner, and evening cocktails. Complimentary transportation is available to attractions within a 2 mile radius. Guest rooms offer complimentary wireless internet access; local telephone calls are free also. TV’s include premium cable channels. Microwave ovens and compact refrigerators are available upon request. Pets are permitted for a surcharge. Located less than 9 miles for the Florida State Fairgrounds. A unique property situated in a quiet scenic location, the hotel has 59 rooms including 32 Townhouse Suites. We are easily accessible from I-75 and I-4 and we are located just 5 minutes from the Florida State Fairgrounds, and 15 minutes from downtown Tampa. The hotel has an outdoor heated pool, fitness center, free wireless internet access and complimentary hot breakfast. Our Townhouse Suites are bi-level lofts with a king bed upstairs, 1.5 bathrooms, 37″ plasma TV and separate TV in the loft bedroom. Our facilities offer over 2,000 square feet of flexible meeting room space that can accommodate business meetings and leisure parities including Wedding Groups. Our property is 100% smoke free. The Mainstay Suites Lounge features $3 beer and wine daily. Miles from the Florida State Fairgrounds. Amenities: The hotel features business amenities including a business center and a meeting/conference room. A complimentary breakfast is available. Additional amenities include an outdoor pool, a picnic area, and an elevator. On-site parking is complimentary. The 125 air-conditioned guestrooms at Quality Inn & Suites near the Fairgrounds and Ybor City include safes and complimentary weekday newspapers. Complimentary wireless high speed internet access is provided. Televisions are equipped with cable channels. All accommodations provide desks and telephones with voicemail. Complimentary evening reception M-Th (includes beer and wine). Fireplaces available in some suites. Sheldon might make a surprise appearance! 100 degree temperatures aren’t uncommon in Tampa this time of year. We built this city on rock and roll! FREE things to do and see! Get it on! The year was 1904. The American flag had 45 stars, Theodore Roosevelt was president and the average American earned just 22 cents an hour. That year, what would be later known as the Florida State Fair opened its gates in Tampa. Since then, there has been incredible inventions, wars, social change and musical styles that have rocked each generation. Still, the Florida State Fair remains a showcase of the best the state has to offer. All active, reserve, former or retired Military Veterans, Law Enforcement, Firemen, and First Responders are admitted FREE! With Valid Identification. Student Day Hillsborough County Schools receive FREE Admission, Ticket Distributed by Schools. FREE Admission for 4-H & FFA Members with Member Identification or Jacket. Student Day, Hardee County Schools receive FREE Admission, Ticket Distributed by School. College Day, Ride Armband $20 at 3PM, Sold only at the Fairgrounds. Ride All Day, Pay One Price. The Florida State Fair is located just seven miles east of downtown Tampa with access via I-75, I-4, Hwy. 301, and Martin Luther King Blvd (Hwy. 574). Parking is FREE with wheelchair accessible parking spaces available at each gate. There is a FREE weekend park and ride shuttle service that runs continuously between Highland Oaks (I-75 at Hwy. 574 Exit) and the entrance gate from 9:00 a.m. until midnight. Gates open daily at 9:00 a.m. The Midway opens at 11:00 a.m. Monday through Thursday, and Friday through Sunday at 10:00 a.m. Expo Hall is open from 9:00 a.m. until 10:00 p.m. daily. Most other exhibits are open from 9:00 a.m. until 9:00 p.m. Cracker Country is open Monday through Thursday, 9:00 a.m. to 6:00 p.m. and Friday through Sunday, 9:00 a.m. until 7:00 p.m.
Get ready to gorge on fried food and spin ’til you’re dizzy, because The Florida State Fair returns to Tampa for its 110th year, Feb. 6 through 17 at the Florida State Fairgrounds. Advance tickets went on sale today at Walgreens stores throughout Florida and AAA locations around the Tampa Bay Area. Tickets are also available at the box office at the Florida State Fairgrounds, by calling 1-800-345-3247, or on the official fair website. The fair’s theme for 2015 is “1st Place for Fun,” playing on the late-winter fair’s status as the earliest state fair of the year in the U.S., a news release from the fair’s organizers said. Among the attractions at the fair will be the “largest traveling roller coaster in North America,” “bizarre sideshow spectacles” including sword swallowing and fire eating, the FMX Motorcycle Thrill Zone and more than 110 free things to do after paid admission, the release said. Musical performers include America, Country Gold, Sister Hazel and Uncle Kracker. Tickets for Country Gold’s concerts Feb. 12 at noon and 4 p.m. require purchase of a reserved-seating ticket. Other concerts are included with admission. There will also be the usual mix of indulgent fair food, livestock, and the rustic Cracker Country, which uses actors and authentic buildings and tools to recreate Florida life in the late 19th century. Advance pricing for admission is $7 for seniors (select senior days only), $9 for adults, $5 for children ages 6 to 11. Children aged 5 and under are free. Ride armbands are $25 in advance. 4 Responses to "Florida State Fair festival 2015 dates and info"
The Florida State Fair is held annually at the Florida State Fairgrounds in Tampa. The official state fair of Florida, it includes indoor and outdoor exhibits, rides and shows. It is a chance for the state to showcase its agricultural industry. The Fair also offers competitions and food oddities such as chocolate covered bacon. The annual event usually lasts for 11 days, usually in February. Welcome to the Florida State Fair! Gates open at 9am Discover the Fun! Over 110 FREE Things to See and Do! In 1904 the South Florida Fair Association was formed and plans for a new exhibition were proposed. The fair was founded as the South Florida Fair and renamed the Mid-Winter Festival a few years later. 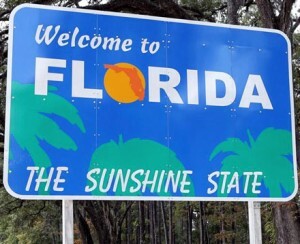 The name finally changed to the present Florida State Fair in 1915. In 1975, the Florida Legislature created the Florida State Fair Authority and designated the yearly event in Tampa as the official Florida State Fair. By 1977, the first fair was held at its current location, at the intersection of Interstate 4 and U.S. Highway 301 in unincorporated Hillsborough County. The Florida State Fair also includes competitions in crafts such as fine arts and agricultural competitions. Entries are judged and ribbons awarded. 2009 saw new additions to the state fair, including a live shark exhibit and a rodeo. Besides the rides and exhibits, other venues during the Fair include the Bob Thomas Equestrian Center, which hosts horse races and other equestrian events; Cracker Country, which demonstrates life in frontier Florida; and exhibitions from most counties of Florida plus various agricultural and other state organizations in the large Expo Hall. Gates open at 10am Discover the Fun! Over 110 FREE Things to See and Do! Welcome to the Florida State Fair! Happy Valentines Day! Fee is $75 for Saturday and Sunday is FREE. Rubbish is $25 for Saturday and Sunday is FREE. The total charges are $100 with the initial deposit due 2/24/14 ($50) and the balance due of ($50) on or before 3/10/14. Please fill out the attached application to be part of this record breaking event and return to Terri Parnell – Longphee at terri.parnell@freshfromflorida.com or fax to 813-740-3505. If you have any questions related to the contract, facility, camping or electrical please contact Terri Parnell Longphee at 813-627-4218. We encourage sample sizes and smaller plates so guests can try several food trucks. Have you ever wanted to be part of something “BIG” and set a record doing so? Well, we have a great opportunity for you to do both. Our goal is to beat our current record in the Guinness Book of World Records!This two day event will be held at the Florida State Fairgrounds on March 29, 2014, Saturday from 11:00 a.m. to 8:00 p.m. and Sunday March 30, 2014 from 11:00 a.m. to 6:00 p.m.Generation Food Truck and the Florida State Fair Authority are teaming together again to create an event to assemble the most food trucks in one area at one time, and we call it the “World’s Largest Food Truck Festival “EVER.”We are looking to have over 200 food trucks, live music, bounce houses for the kids and a car show to entertain the guests that will be attending the event. The Fair returns February 6th through 17th at the State Fairgrounds. There will of course be their famous rides, food, Cracker Country, and all the entertainment that the Fair has always brought each year. Tickets are already on sale or by purchasing them at the fairgrounds box office, Walgreen’s or Tampa Bay AAA locations. What is the Florida State Fairgrounds? The Florida State Fairgrounds islocated adjacent to I-4 and I-75 in the heart of the bustling Tampa Bay area and home of the Florida State Fair. The Fairgrounds facilities host a wide array of events throughout the year, everything from special interest shows and conventions to educational tours and headline entertainment. See our Events Calendar to plan your next visit. Who owns the Florida State Fairgrounds? The Florida State Fairgrounds, home of the Florida State Fair is owned and operated by the Florida State Fair Authority which was created under the Florida State Statutes Chapter 616 as an instrumentality of the state under the supervision of the Florida Commissioner of Agriculture. The Florida State Fair Authority and its Board of Directors mission is to create positive entertainment experiences and provide opportunities for competition, education and community service through the annual Florida State Fair. The Florida State Fair Authority does not receive state, county or city tax dollars. Revenue is generated by the annual Florida State Fair as well as the other events that are held on the Fairgrounds throughout the year. What is the physical address of the Florida State Fairgrounds? There are entrances into the Fairgrounds property.